Belle Mare, while a small place, has a big reputation. Located on the Mauritius east coast, it is home to quite possibly the most attractive white sand beach anywhere on the island. 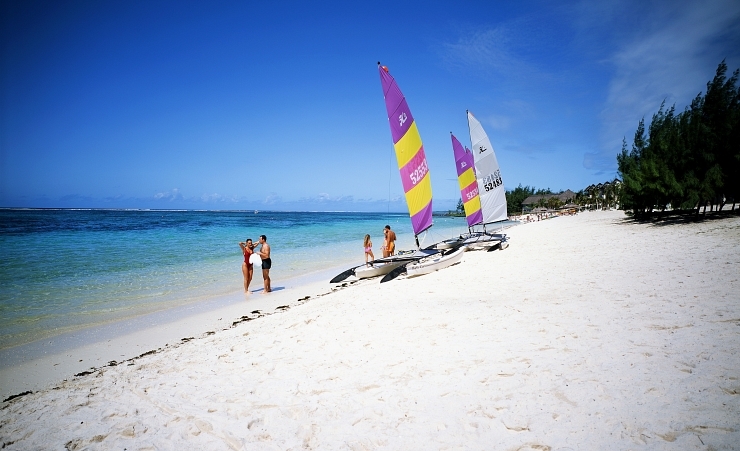 But the beach is not the only thing Belle Mare has to offer. The coral-protected lagoon, moored in the crystal blue Indian Ocean, offers a great array of water sports and a huge variety of restaurants and world-renowned golf courses make this a very appealing destination indeed. The hottest time to visit Belle Mare is at the beginning of the year between January and March, when average temperatures are in the high-20s. In late January/early February, you can expect temperatures to hit the mid-30s. In terms of crowds and when to avoid them, the busiest months for tourism are November, January and March. If you’re in Belle Mare, you’re here for the luxury. That being said, there are some attractions away from the beach and resorts that are of interest. To truly tear yourself form the sand and sea, the shopaholic in you will appreciate the short 15-minute taxi ride to the town of Centre de Flacq and its modern mall. The Belle Mare beach is every bit the postcard setting you want from such a getaway, offering some of the very best white sand and azure-coloured ocean anywhere on Mauritius. It is 10km in length, so a walk along the shores is there for the taking. But for those looking to kick back, we’d recommend relaxing beneath a filao tree and taking in the stunning scenery. When it’s time to cool down a little, you’ll find the sea shallow, calm and perfectly suited to the tranquil setting. The all-star line-up of resorts and hotels bring with it a lot of choice where dining out is concerned, including even a couple Michelin-star chefs. The Deer Hunter restaurant that overlooks the 18th green of one of the island’s famous golf courses is a particular highlight. If you’re not looking to break the bank with every meal, then a compromise can be found in Symon's Restaurant, which may not be as good as some of the glittering 5-star options, but there are many dishes that stand out. There is a popular weekly sega dance show hosted on the beach that features drummers, dancers and an open fire – what’s not to like? There are also regular barbeques and cocktail parties that are hosted by the various hotels as part of their themed evenings. If that’s not your scene, head indoors for the numerous chic options that hotels specialise in, with chilled DJs or live jazz bands. Home to a number of international tournaments, The Links and The Legend golf courses share headline status alongside the beach. With stunning fairways, a technically challenging layout, and a back-drop that is hard to beat anywhere in the world, it’s worth considering heading to Belle Mare for the golf alone. If golf isn’t for you, maybe the lagoon life offers more of an appeal, where diving, snorkelling and glass-bottom boat rides are readily available. Centre de Flacq provides buses to Palmer, but they don’t go all the way to Belle Mare, so the onward journey will require a taxi. When in Belle Mare, taxis are available and, if staying in one of the many hotels or resorts, the concierge will be able to assist you. Why holiday in Belle Mare?